As the mother of a Marine infantry lieutenant, I was blessed to have my son home during the Christmas holidays each of the four years that he was in the Marine Corps. Even his deployment to Iraq during the invasion began in January and returned him home in one piece the following fall. We were very lucky to be able to celebrate the holidays with him each year, and I am looking forward to Christmas this year with him home – this year with a fiance and a February wedding on the horizon. Not every family is as lucky as we were. It is hard on the families to have a member of the family away from home during the holidays – and it is even worse for the member of the family away from home. 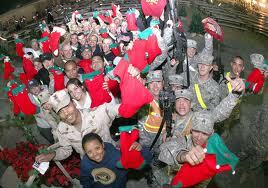 The holidays can be one of the most difficult times of the years for military personnel serving away from home. The simplest gesture—a call, a card or a gift can make a huge difference in their morale. There are countless organizations that help facilitate the gift giving process, and here is a guide to help you select a group to help you send something to the troops this holiday season. Use generic salutations such as “Dear Service Member.” Cards addressed to specific individuals cannot be delivered through this program. The popular photo card website is offering to send up to 1.5 million cards to the troops. Visit their Facebook page where you can customize a card with images, photos and text. Shutterfly will then send them to the troops. In a bit of twist, Sears’ “Help a Hero” campaign seeks to assist deployed soldier in sending gifts to their families at home. Their website features a wish list of practical items such as clothes, toys and decorations. This organization collects donations of airline frequent flyer miles to help injured military personnel travel home from a medical center or enable their family members to visit them. Many major airlines are participating in this program visit their website for more details. Financial donations to help defray the production and shipping costs. For 2012, this organization’s theme is “Seasonal Sights, Sounds and Sweets.” They are looking for donations of DVDs, photos, signed banners, handmade paper garlands with messages, signed holiday cards, felt stockings, ornaments, artificial trees & wreaths, lights, fleece blankets, small menorahs, dreidels and any small gifts or stocking stuffers. Thanks to the Chevy Chase Patch for these great suggestions. Next Next post: Coop or Condo – Does it Matter?